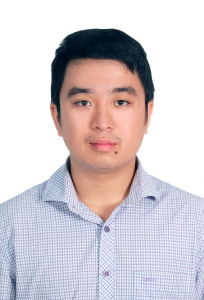 Nguyen Thai CUONG completed a Master degree in Advanced Materials for Environment in 2017. It was a joint program between Hanoi University of Science (Vietnam) and University of Toulon (France). During this time, he has also earned an Erasmus scholarship for a 3-month internship at the University of Mons where he received intensive training in Scanning Probe Microscopy techniques. His Master thesis was about the characterization of Barium Titanate based-nano composites. At the end of 2017, he joined the University of Mons and the Laboratory of Chemistry of Novel Materials as a PhD student in the group of Prof. Roberto Lazzaroni, under the supervision of Prof. Philippe Leclère. His PhD is a part of a research project between several universities in France and in Belgium. His main topic is to characterize the piezoelectricity of bio-based polymers at nano-scale level.